contains 1x15 ml plastic easy-squeeze tube. Women in 40-ish I suppose have the highest tendency to getting eye bags compared to women of younger age. It’s because at this age range the skin around the eye area tends to slowly loose its elasticity and can accumulate water quickly - that is often the cause for having large bulges and dark circles around the eyes. Sleeping so late, reading books and crying on the side while holding a brightly lit iPad can further aggravate the dark eye circles and puffiness circumstance. #alamna, lol. And as the normal order of beauty ritual suggest, one should apply eye cream to get rid of this dark circles and puffiness. I should be honest that I haven’t really gotten into the culture of eye creams and cold creams. I must say with lipstick? Yes, very much so immersed. But not a moment I can remember that I skimmed the shelves for a product to alleviate my Panda eyes. I do treat them though, but I go with my usual cheap, easy-to-reach kitchen remedy. You know how cucumbers and scrap tea bags work, right? 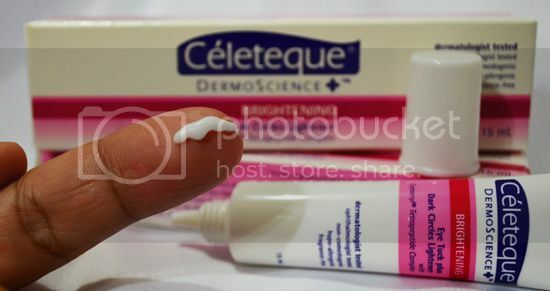 And so, when Unilab sent me samples of their Brightening line products, the Celeteque Dermoscience+ Eye Tuck plus Dark Circles Lightener, I didn’t hesitate to try. I carefully followed the instruction. It’s legibly printed on the box and used the cream cautiously not to enter my eyeball. Though this product is tested by ophthalmologists, one should really be extra careful when it comes to applying beauty products around eye area. Anything foreign entering our eyes can cause stinging. And in my case, I’ll do it all over again as I have to wash it out of my eyes. This product contains Eyeseryl Tetrapeptide Complex, a cosmetic formulation that contains high potency eye lift solution. 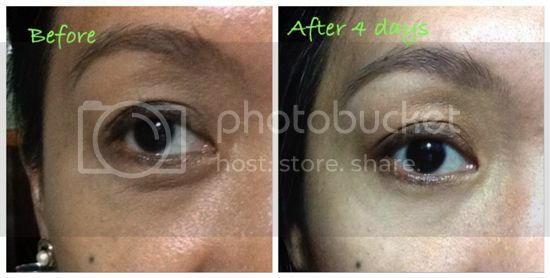 The Tetrapeptide Complex is also known to have proven efficacy in lessening swollen eye bags. It’s also proven to work effectively to lift and firm sagged skin. Having these wonders bottled together and promised to work wonders with my puffy eyes, I felt I should let go for the meantime my kitchen remedies and try this product out. The white cream is fragrance-free and comes in a right consistency that glides smoothly when dabbed into my skin. It’s not greasy and felt it penetrated my skin shortly after slight dabbing around my eye area. I also love how I can have a good control of how much cream I need out. The easy-squeezy container is hygienic and ultra-convenient for me. This product is non-comedogenic and its hypo-allergenic so it’s safe for all types of skin. After 4 days of night and day religious use of this product, my eye puffiness noticeably, gradually disappears. I still have dark circles around my eyes though. 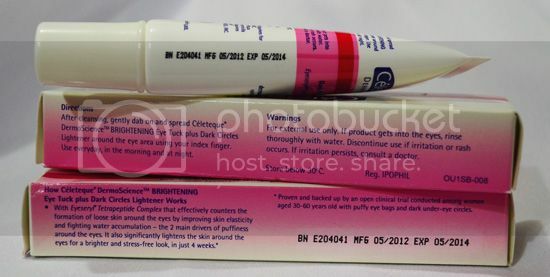 But given the short usage period, I would assume extended use up to 4 weeks would significantly cement my tiny lines of wisdom and would significantly brighten my eye area and definitely get rid of the eye puffiness all the way. 1x15 ml for P299 is not at all bad for a highly effective product such as this. So worry no more about your Panda eyes and little wrinkles around it. Lighten and smoothen them up and see the world in its bright side. Get your CELETEQUE DERMOSCIENCE+ BRIGHTENING EYE TUCK PLUS DARK CIRCLES LIGHTENER today as I certainly recommend you try it! 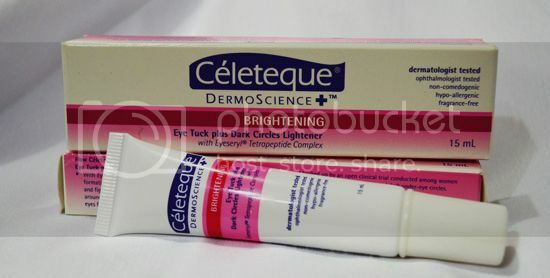 CELETEQUE DERMOSCIENCE+ BRIGHTENING EYE TUCK PLUS DARK CIRCLES LIGHTENER is another quality product of Innovitelle, Inc. A subsidiary of Unilab Laboratories, Inc. and is available in all leading drugstores and beauty counters nationwide.